Hockey Alberta’s 111th Annual General Meeting (AGM) was held on Friday, November 23 and Saturday, November 24 in Red Deer. The meeting included presentations, information seminars and discussion forms for Executive Members of Minor Hockey Associations, Sports Schools and Junior/Senior Club Teams, as well as Executive Members of our sanctioned leagues. Friday evening features a special presentation, trade show and networking social. Saturday opens with a series of President Meetings followed by the Awards Presentations and Annual General Meeting.. Please note that Member Dues for the 2018-19 season and any overdue accounts must be paid in full for Members to be eligible to vote at the Annual General Meeting. Please refer to Article 4, 4.6 (b) of the Hockey Alberta Bylaws and Regulations for information about voting privileges/procedures. The 2018 Annual General Meeting provides opportunities for member Minor Hockey Associations, Senior and Junior Club Teams, Sport Schools, Pond Hockey programs, Sledge Hockey programs and League Administrators to participate in interactive sessions targeted at some of the hottest topics in the game today. The meeting includes guest speakers, presentations and workshops involving people from all different aspects of amateur hockey. The weekend also includes a Trade Show and Social, Awards Presentations, the Annual General Meeting and an Open House at Hockey Alberta’s office in Red Deer College’s new Gary W. Harris Canada Games Centre. Allyson Tufts is a new author that has had many meaningful careers to date. For many years, she followed her passion to work in non-profit. She worked as a Campaign Manager for United Way, heading up a campaign along with a group of staff and volunteers that raised over a million dollars to go back into the community. From there she followed her passion to work for a non-profit organization called Hospice, which is an organization that cares for people who are suffering from a life threatening illness with no known cure. Allyson sat at the bedside of several palliative patients at the end of their journey and facilitated several grief support groups for children and adults who were left behind. Three years ago she returned to work in Human Resources. While working part time, she decided to return to school in 2013 to obtain her diploma in Social Work where she graduated on the Dean’s List. Throughout her career, her proudest accomplishment has been that of being a wife and mother to her husband and two children. It was raising her kids and watching her son play hockey that brought her back to her childhood love of writing. Spending so much time in the rink was a source of joy and extreme stress. Watching her brothers, husband, and young billet could never prepare her for the stress of standing behind her son’s net for his debut as a goalie. As a woman who suffers from anxiety, the only thing that seemed to relax her was writing about her experiences. As her stories started to pile up, she realized that not only were they funny and witty, but most importantly, they could be helpful to other parents going through the Minor Hockey experience. She decided to take the leap and put her stories into her first novel and so was born, “Lessons From Behind The Glass”. After the Keynote Address, Friday night provides an opportunity for delegates to interact with people from other associations and organizations. The Trade Show & Social will take place in a casual atmosphere and includes information booths set up by Hockey Alberta sponsors and partners. Appetizers will be served and a cash bar available. 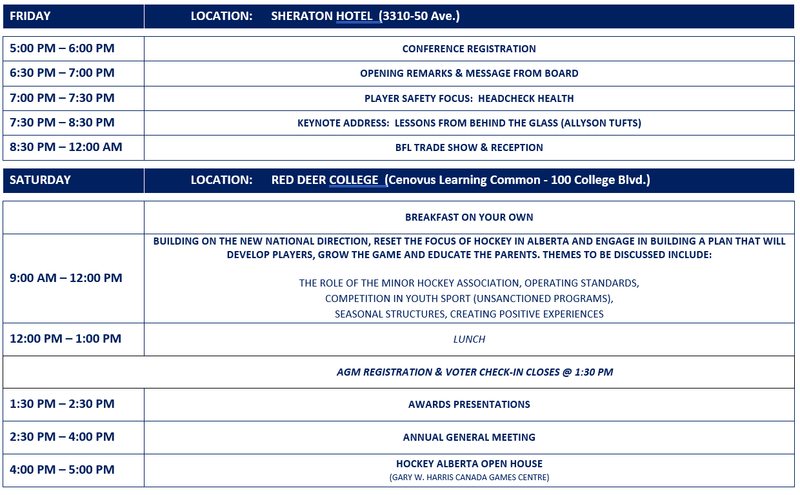 This year’s meeting will include a three-hour session consisting of discussion and workshops designed to engage association and team executive members in building a plan for the future of hockey in Alberta. Drawing on the lessons from Friday’s Keynote Address, delegates will be challenged to evaluate the status quo and think outside the box while discussing potential changes to the hockey model within which we currently operate. The session will provide information on Hockey Canada’s Future direction as well as an overview of the current environment within which hockey exists. Competition in Youth Sports: Evaluating the existing hockey system and identifying the reasons for recent growth of unsanctioned programs at the recreational and competitive levels. Operating Standards: Evaluating the role of the local association in the leadership, development and delivery of programs and identifying governance, structural and implementation strategies that will help create more positive experiences for players in the game. Seasonal/Team Structure: Evaluating the current practices for establishing the framework of schedules for both practices and games and identifying modifications that can be used to provide a better experience for players and optimize the developmental time available to them. Options in the Game: Evaluating programs that exist within and outside of our sanctioned hockey system and identifying what is required to establish more choices for families. The Awards Presentations recognize individuals from within amateur hockey in Alberta. This event consists of presentations to those administrators, coaches, officials, players, and associations that have made a significant contribution to hockey in their community and/or Alberta over the past season. The Presentations will be made prior to the AGM being called to order. Following the Annual General Meeting, and before heading for home, all delegates are invited to attend an open house at the new Hockey Alberta offices in the Gary W. Harris Canada Games Centre at Red Deer College. The Open House runs from 4-5 pm and includes refreshments and a small gift for everyone who attends. The report of the Directors, if any. NOMINATION COMMITTEE FINAL REPORT: Hockey Alberta’s Board of Director positions are elected by the members of Hockey Alberta at the AGM. There are three (3) positions of Director at Large up for election at this year’s AGM and each successful candidate will be elected to serve a term of three (3) years. Per Hockey Alberta Bylaw 5.2, the final date for nominations to be accepted for Board of Directors elections was November 9, 2018 and therefore the nomination process is now closed. Per the Hockey Alberta Bylaws, the following individuals have filed a proper nomination application with the Nominations Committee and will be brought forward for election to the Board at the 2018 Annual General Meeting (AGM) on Saturday, November 24.